Getting New Plasma Cutters in Sydney at very affordable prices is now easier than you may think. Our range of new plasma cutters for sale have the best warranty covering parts and labour for a full five years. 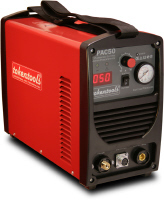 There are two types of new plasma cutting machines for sale at Tokentools Welding Equipment Supplies. The HF type of plasma cutter uses a high-frequency, high-voltage spark to ionize the air through the torch head and initiate an arc. These do require the torch to be in contact with the job material when starting, and so are not suitable for applications involving CNC cutting. More basic machines require tip contact (scratch) with the parent metal to start and then gap separation can occur similar to DC type TIG welders. These more basic type cutters are more susceptible to contact tip and shield damage on starting and are old fashioned by todays modern plasma cutting machine standards. The other type is the Pilot Arc Plasma Cutter. It uses a two cycle approach to producing plasma, avoiding the need for initial contact. First, a HF, low current igniter is used to initialize a very small high-intensity spark within the torch body, thereby generating a small pocket of plasma gas. This is referred to as the pilot arc. The pilot arc has a return electrical path built into the torch head. The pilot arc plasma cutters will maintain itself until it is brought into proximity of the workpiece where it ignites the main plasma cutting arc. Plasma arcs are extremely hot and are in the range of 25,000 °C. Plasma cutting is an effective means of cutting thin and thick materials alike. Hand-held plasma cutter torches can usually cut up to 2 inches (51 mm) thick steel plate, and stronger computer-controlled torches can cut steel up to 6 inches (150 mm) thick. Since plasma cutters produce a very hot and very localized “cone” to cut with, they are extremely useful for cutting sheet metal in curved or angled shapes. Call us on 1300 881 991 to discuss your needs. Our staff are very helpfull and can guide you to get plasma cutters that suit your needs.